This tale begins back in early July, 2016, only two months after we returned home from our second Bahamas trip. We took a drive to Noank to look at an 11-foot Penguin sailboat in Noank. Our first look at the Penguin. Why don’t people clean their boats when they put a for sale sign out?? SOLD. A new project for Al! I am all in favor of new projects for him. There isn’t as much to do on Kindred Spirit anymore so I live in fear that he will sell her just to have another boat to reinvent and remodel. The Penguin at home, getting a good and thorough cleaning. 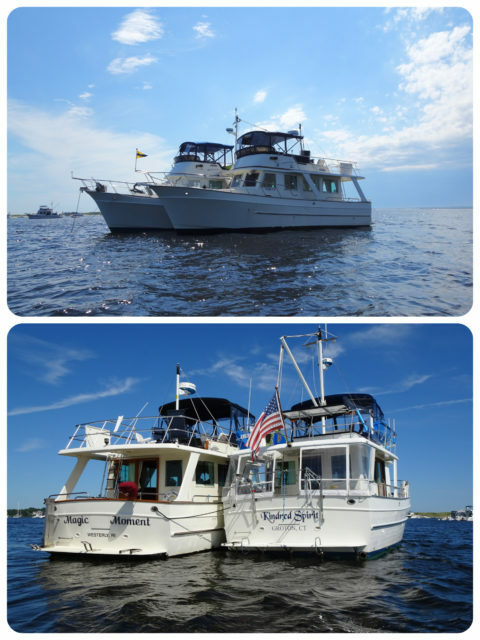 We had the original bill of sale with the boat so we researched as much as we could about the boats. 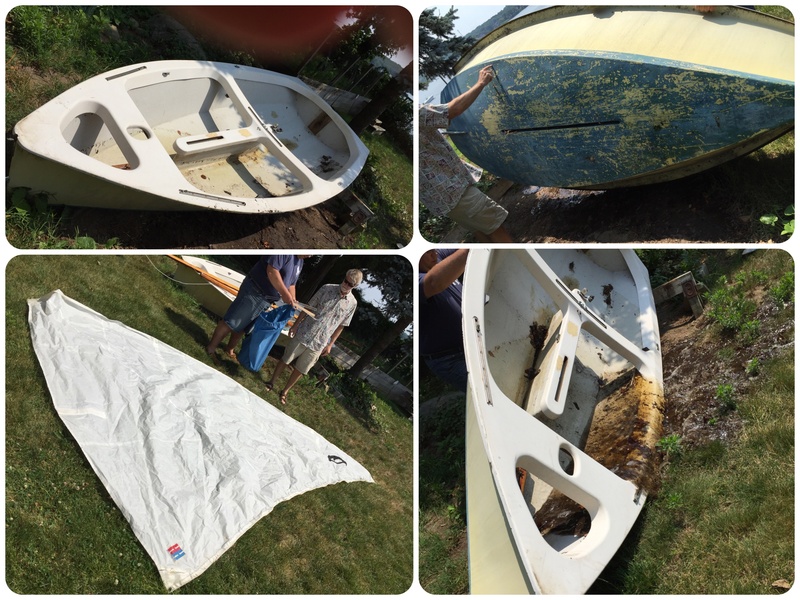 This one was Hull #7746, fiberglass, and originally sold to a man in Illinois in 1967 through McNair Marine in Higganum, CT. Many of the Penguins were wooden “kit boats” that you built yourself. 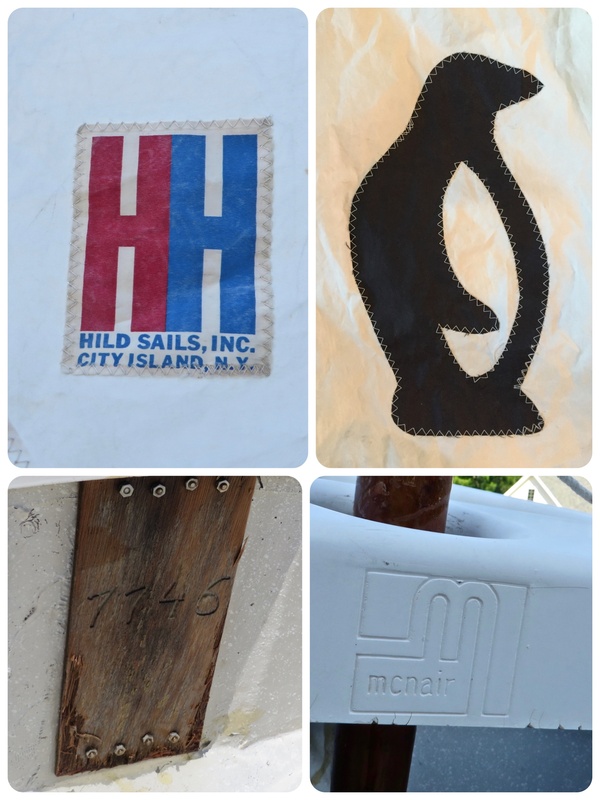 Some of the identifying marks on the little boat. 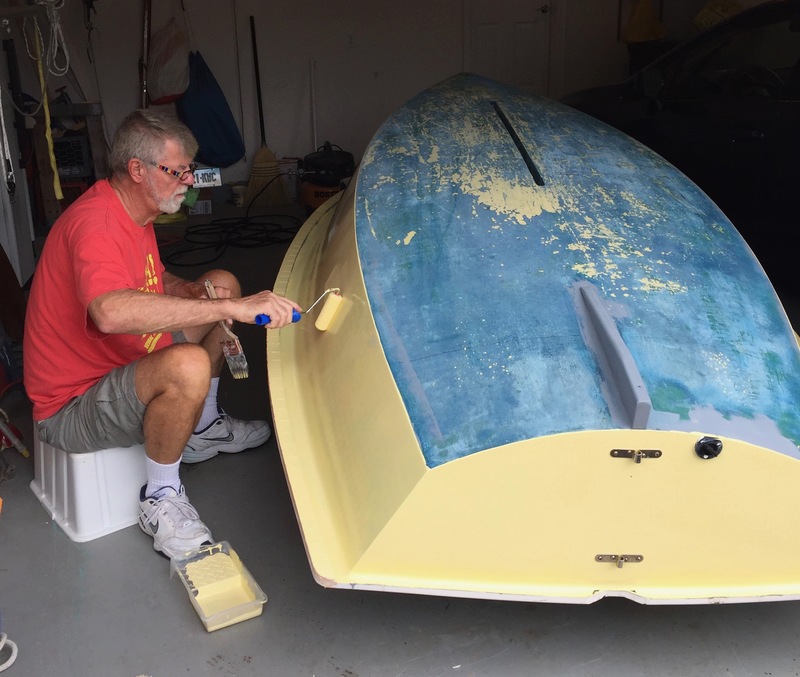 Al got right to work repairing dings and cracks, and painting the interior and exterior. The Penguin needed a facelift. Dings and rough areas needed to be filled before the new coat of paint inside. Even 2 year old Caleb enjoyed a little time in Buttercup, in the garage. 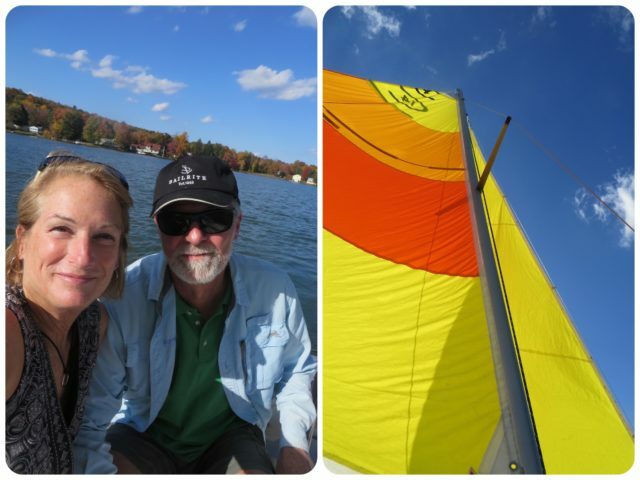 We took Buttercup for a test sail on Lake Beseck in Middlefield. 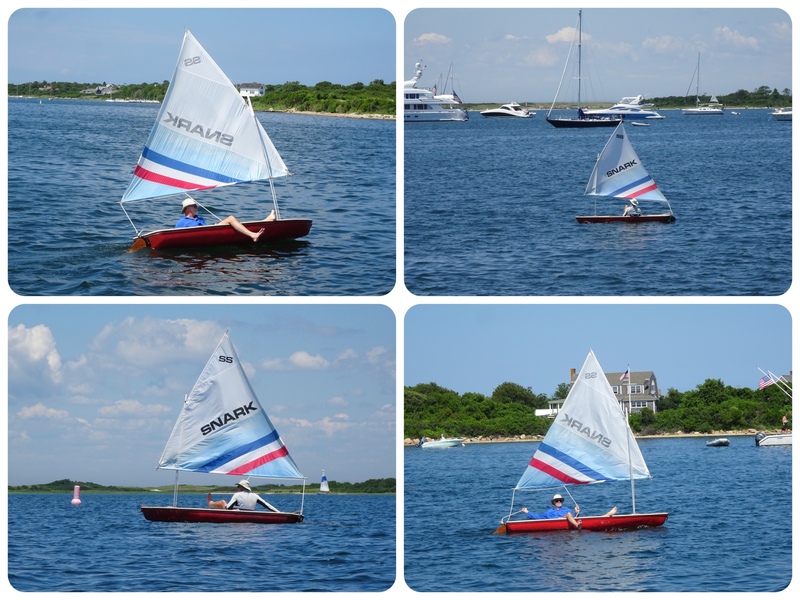 It was fun to be sailing, but she was not very comfortable and difficult to move around in, especially for me. Before September ended, Buttercup was sold to a very nice gentleman who would be sailing her on a lake in New Hampshire. So she did get a new life after all. You know what I miss most about Buttercup? The name and color. I really, really liked both. Before the month was over, we were on our way to look at a Catalina Capri 14.2. 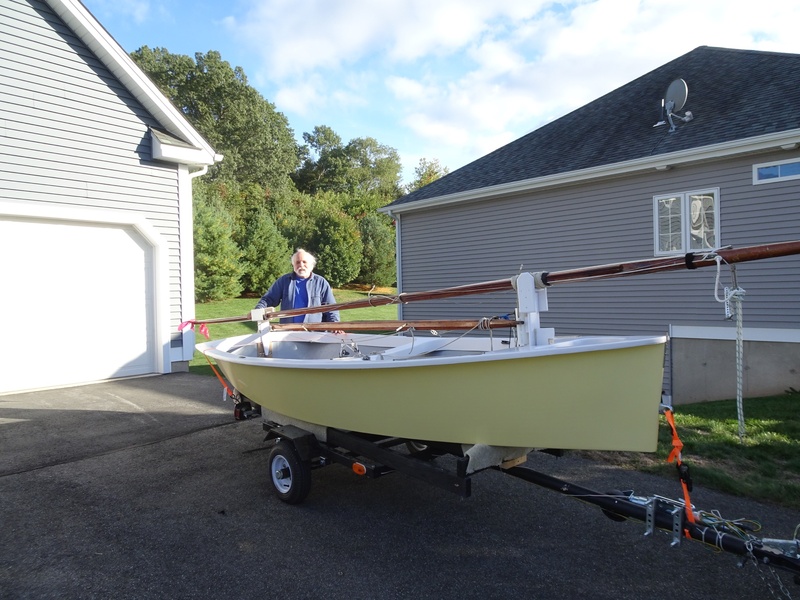 Al was secretly researching small trailer-able sailboats that would be more comfortable and less tippy. He decided a Catalina Capri would do nicely. 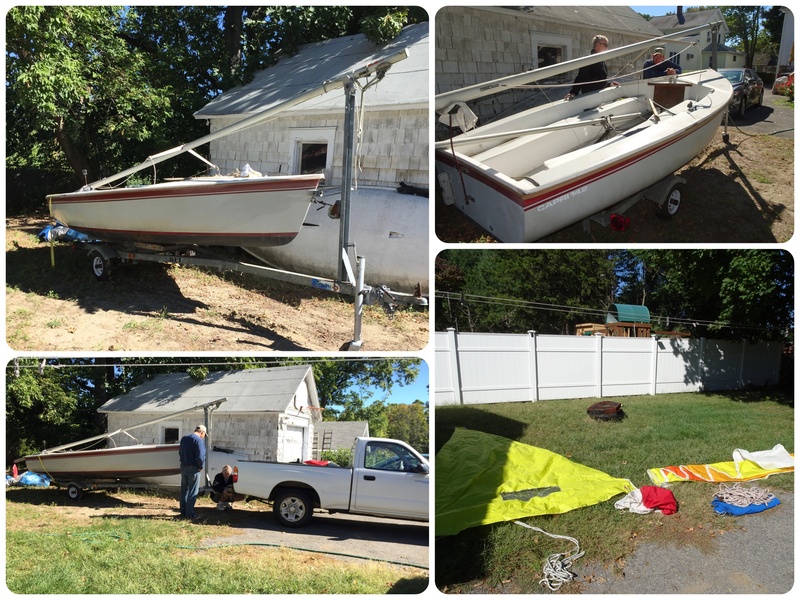 It was somewhat fitting since we had loved our Catalina 34 sailboat. It only took two possibilities to settle on one with a good price. 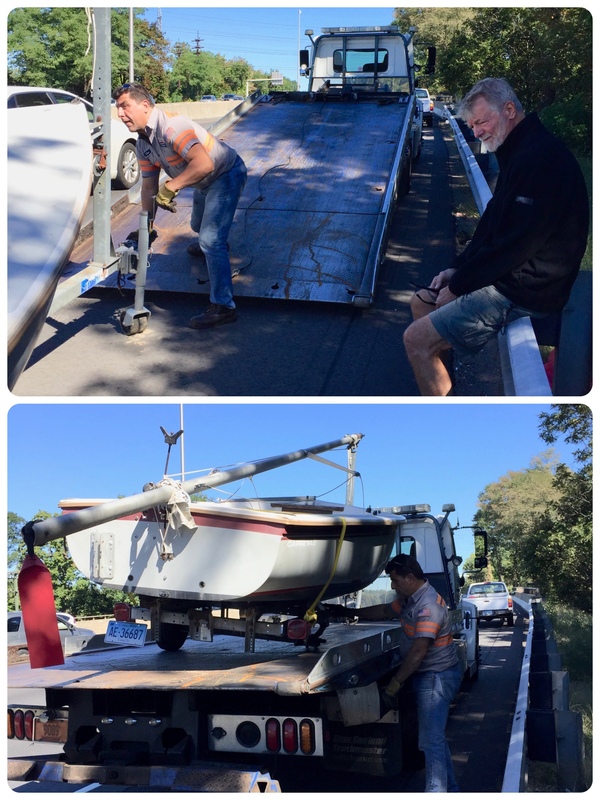 A deal was made for the boat and the trailer so off we went. But not very far, I am sad to say. The wheel froze to the axel on the trailer, broke off, and the wheel went spinning across three lanes on I-95. Oh no! Oh no! There was no way either one of us was going to cross three lanes of traffic to fetch that wheel sitting on the opposite side of the highway. Cars were whizzing past us. 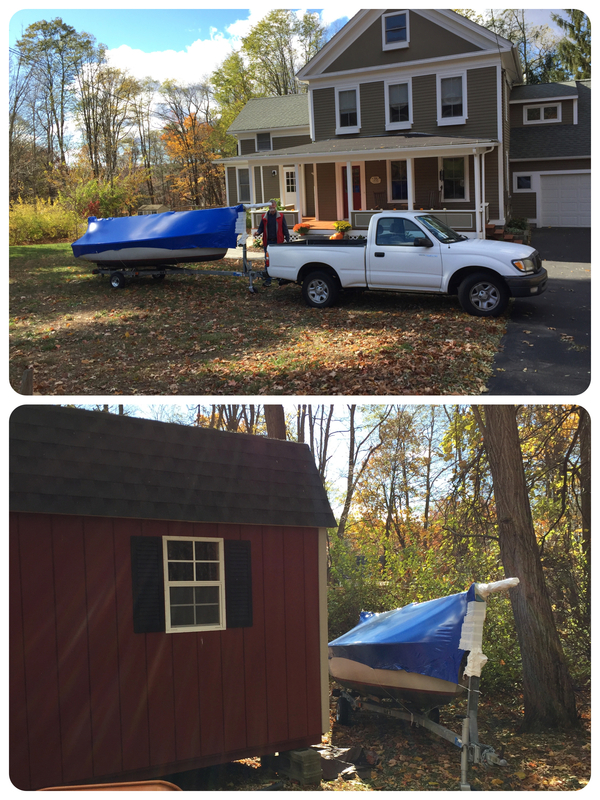 We had the trailer and boat towed to a garage in Stamford to be repaired. Cha-ching. What a nice guy with the tow truck. He did a fine job of taking care of things. Not the best boating day for Al, as you can see from his expression as he sits on the guard rail. My thoughts — it was actually a good day. When that wheel went flying across I-95, it didn’t cause an accident and no one was hurt. That’s all that matters. 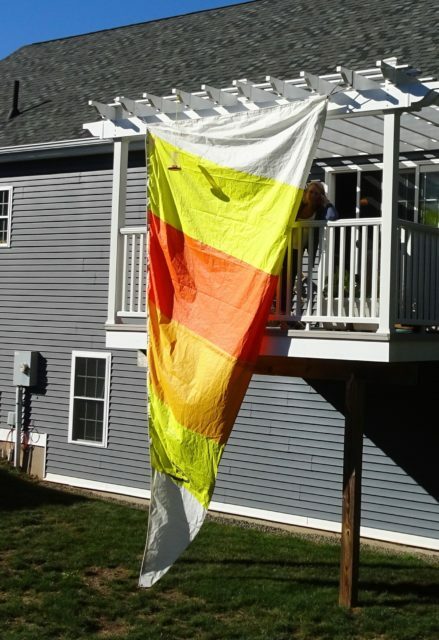 A freshly washed main sail hangs out to dry on our deck. This boat needed a name (I’m a fan of naming boats.) With the colorful sails, I decided to stay with the flower theme, so Marigold she is! The Capri 14.2 fit in the garage, but the mast didn’t. When backing the trailer into the garage with the mast stored on its deck, it can’t be any longer than 17 feet to fit in our 18-foot long garage. That mast is too tall for our garage. Al had a solution, of course. He decided to cut off the top of the mast. The mast track was damaged at the top two feet. Lo and behold, that is exactly what needed to come off. 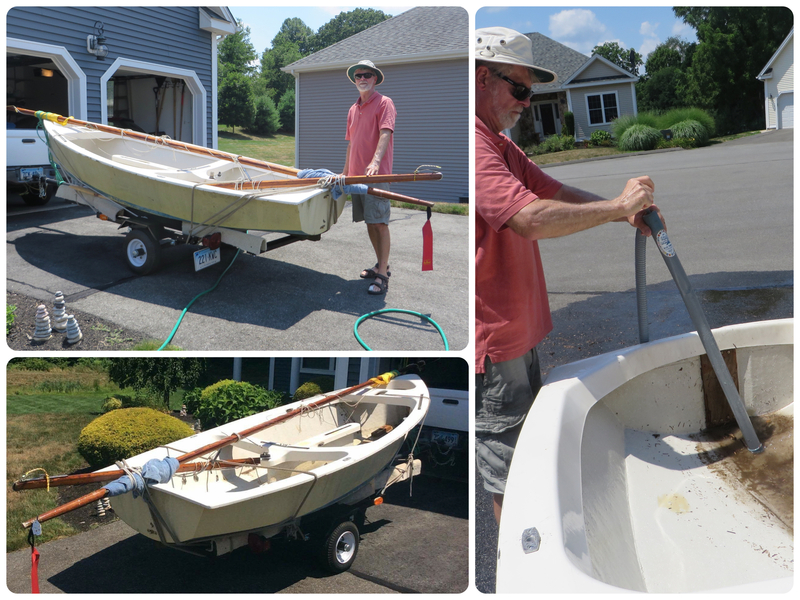 19 ft – 2 feet = 17 feet and it will fit in the garage! But now the sail is too tall. Decision time – cut from the bottom or the top? Cutting time! Al carefully trimmed the top of the sail. 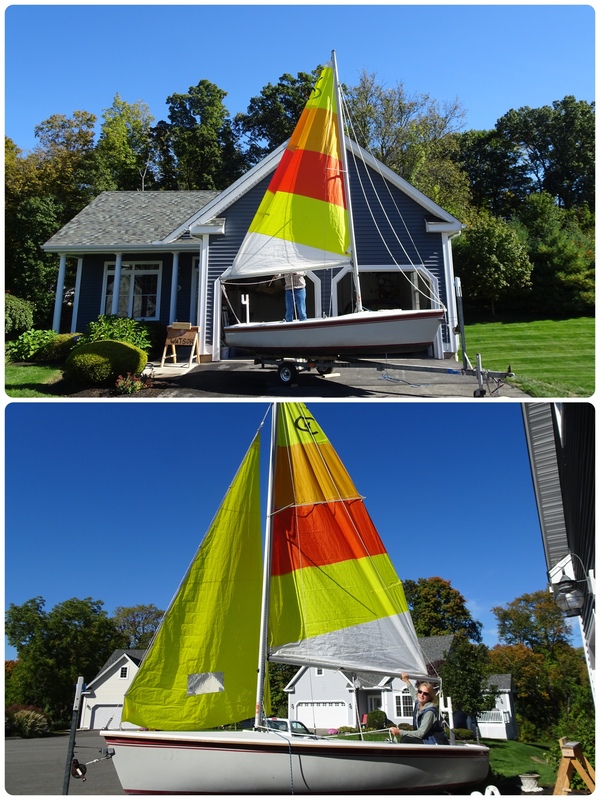 The new shorter mast and sail. With less sail area, we won’t sail as fast, but the boat will be less tippy. We aren’t racing this little flower so I am just fine with that. 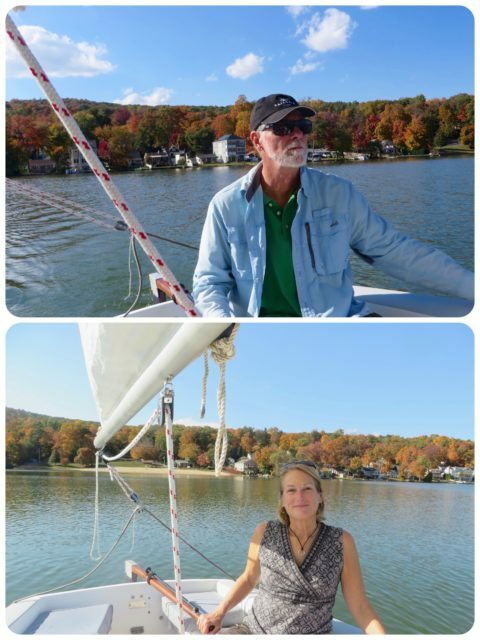 Our first sail on Marigold was October 19th, a gorgeous day. We both agreed that the Capri 14.2 was much more comfortable to sail than the Penguin. 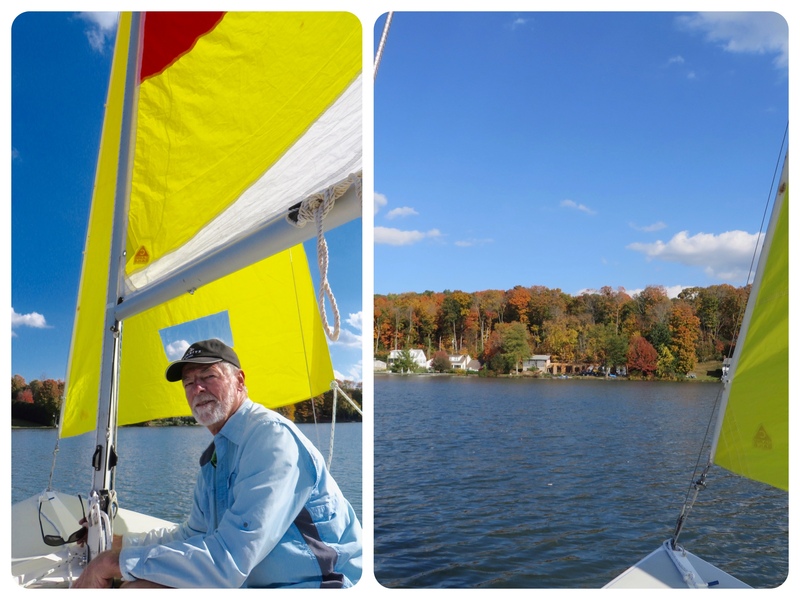 October sailing in New England – maiden voyage for the new and improved Marigold. 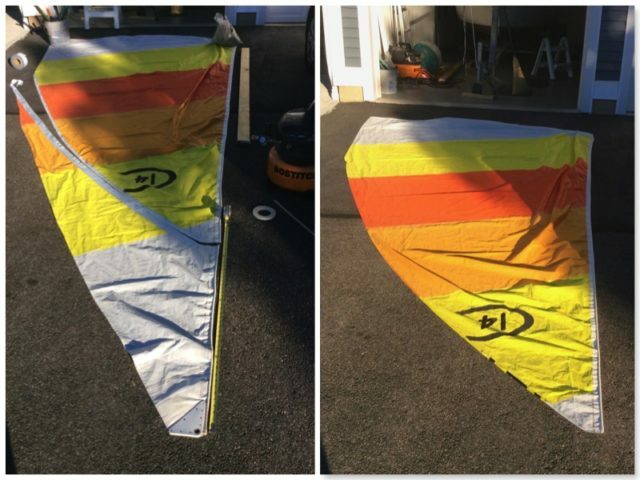 The sail shape is good. 🙂 Smiles all around! 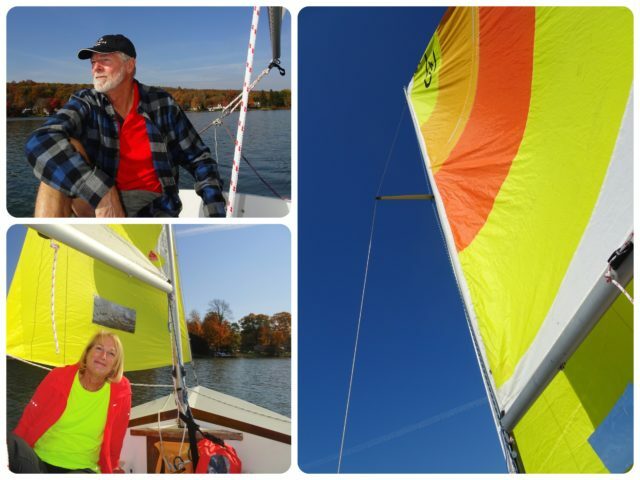 This is hard to believe, but we managed to go sailing on Marigold again, on NOVEMBER 2nd!! Please note that I color coordinated my outfit with Marigold’s sails. And then it was time for winter hibernation. Marigold can’t stay in the garage for the winter, the truck needs the garage. Shrink wrap and off to Avon to be stored behind our son’s shed. Just to wrap this tale up, we did take Marigold for sailing this summer. I am starting to feel more comfortable with a little boat. Sure is different than a 43-footer!! There is a third boat in this tale. In February, while I was visiting my parents in Pennsylvania, Al sent me photos of a new acquisition. It was such a deal, how could he resist it??? 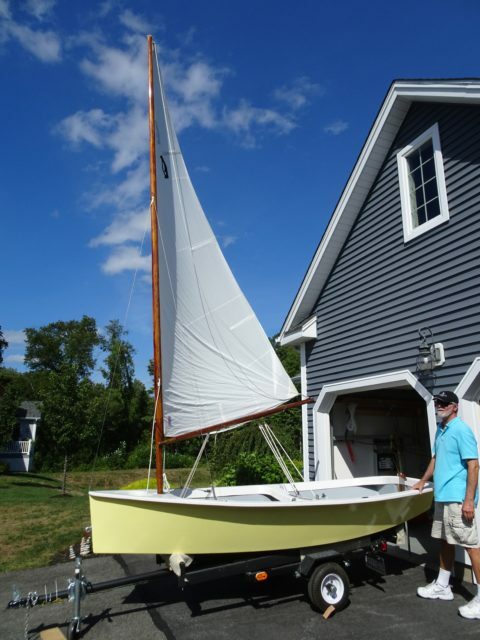 He bought a Super Snark , an 11-foot simple sailboat. Here is the photo that Al sent to me. 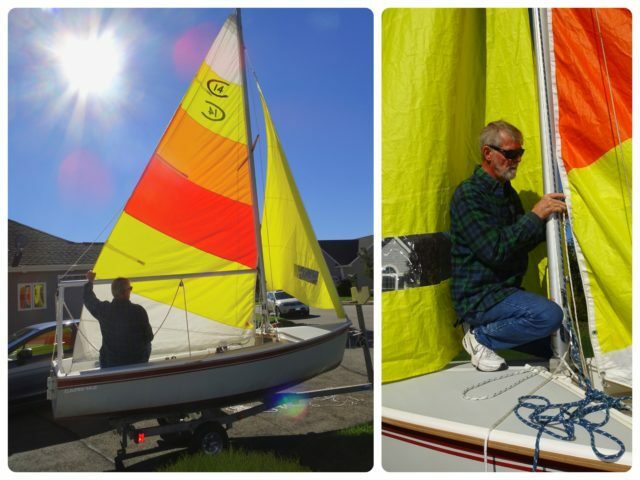 It was February, but he was thinking sailing, even in the snow. I really can’t leave him home alone. A two-car garage becomes a 2-car/2-boat garage. The amusing part of this purchase wasn’t the price (very, very inexpensive), but the reason why the seller was parting with his Snark. 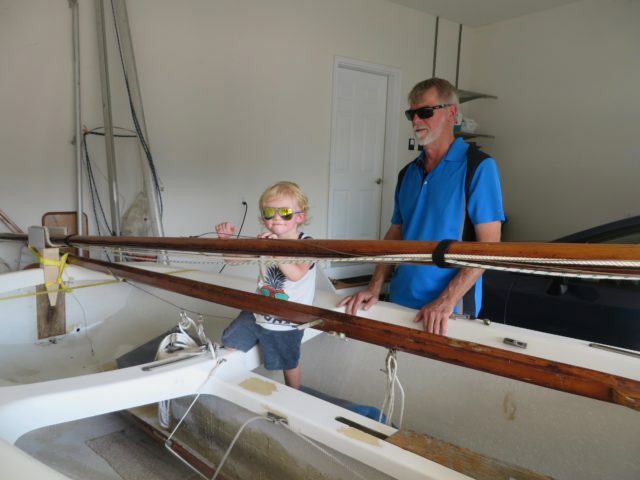 He told Al that he was moving to a “55 and older” community and just didn’t have space to store the boat. Hmmmmm….. and where do we live?? In a “55 and older” community. I just had to laugh. LOL. Al sent this photo to prove to me that we did have space for the little boat. 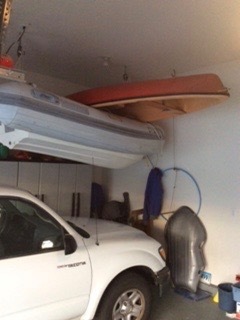 There it is tucked on top of the inflatable dinghy that hangs from the garage ceiling during the winter. 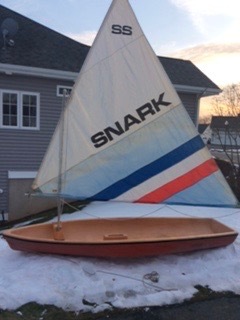 Snark is one of the largest sailboat manufacturers. 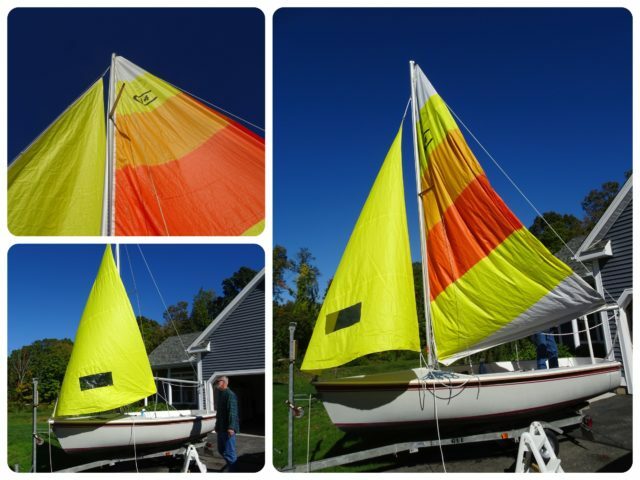 Over 500,000 Snark sailboats have been made since 1958 and are still in production. They were even sold through Sears and Penney’s catalogs. 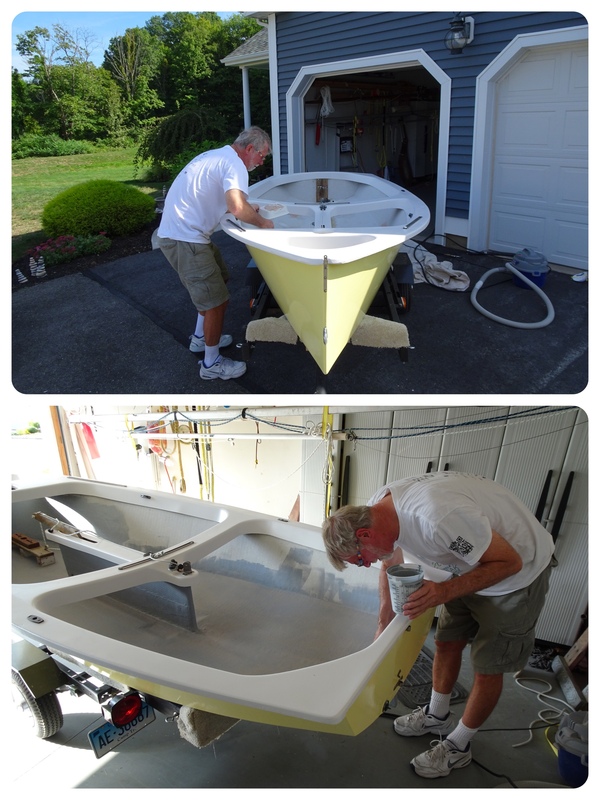 The Snark is an 11-foot solid expanded polystyrene foam hull covered with a thin layer of ABS polymer (plastic). A new one sells for $1221 now. In 1971, Kool cigarettes initiated an advertising campaign where consumers could mail order a Snark with the Kool logo on the sail – for $99 along with one KOOL carton flap – including delivery. Guess who acquired a used one of those??? 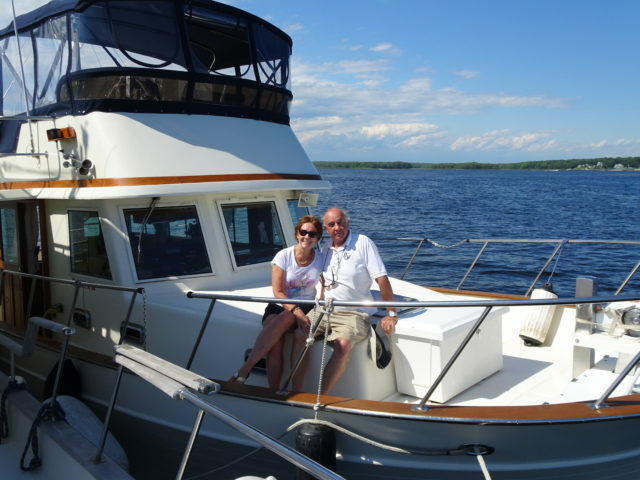 I refer you to our 50+ Years of Boats page in this blog where you will see the one Al had. Here it is again, below. 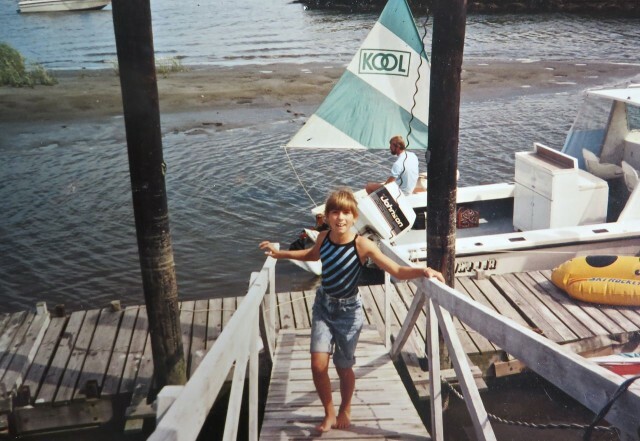 From “50+ Years of Boats” Look in the background – Al is in the KOOL boat, bought second-hand. This little Snark only needed new lines, some varnish and cleaning. The sails are soaking in a bath of OxiClean and detergent. Worked pretty well. 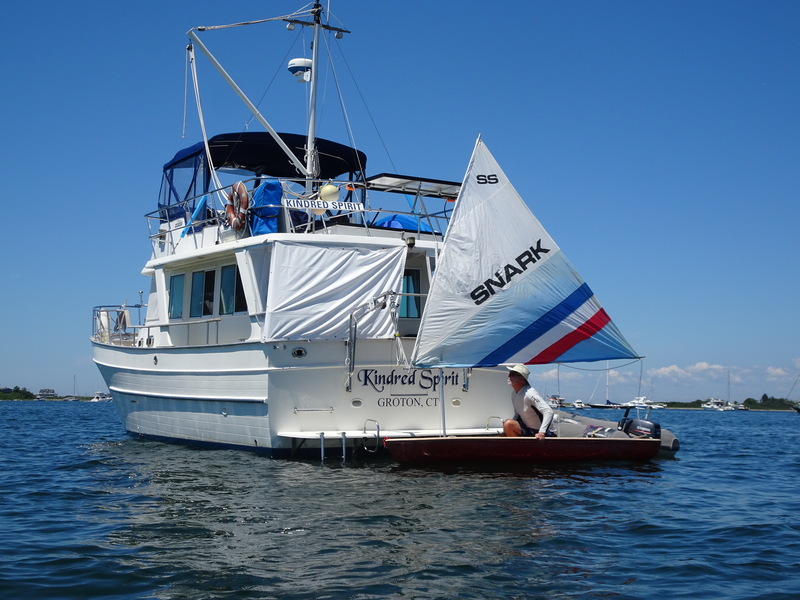 On our first trip to Block Island this summer, the Snark was added to the “fleet”, joining the two kayaks on the sides of the flybridge. Our fleet hanging off the transom of Kindred Spirit. Enough toys?? Ready for his maiden voyage in the little Snark. Al had a blast, snarking around Salt Pond. He was all over the place. A snide, sarcastic, or disrespectful attitude To be snarky is to be cranky or irritable. I hope that the Snark sailboat company was leaning more towards the silly poem rather than the actual definition. 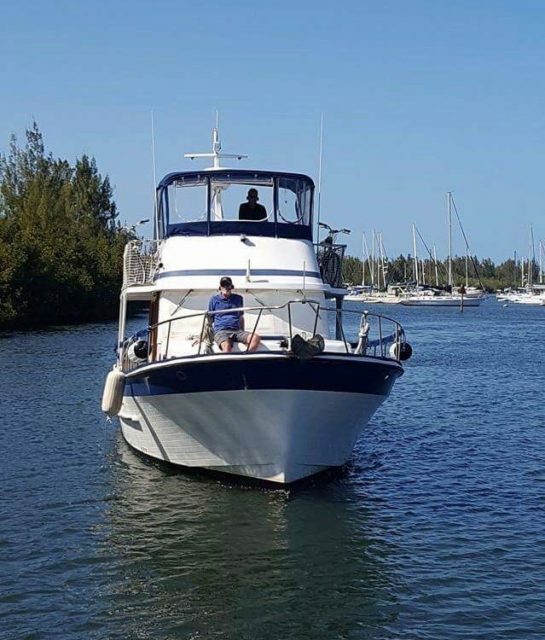 Soooo, what can I name this little boat? The hull is a rusty red, the sails are blues, white, and red. I would like to keep the flower theme going, but I am at a loss. Any suggestions???? Chrysanthemum? Rosey? Zinnia? Poppy? Taking a page out of Bob Marley’s songbook, with just a little twist on one word ….. 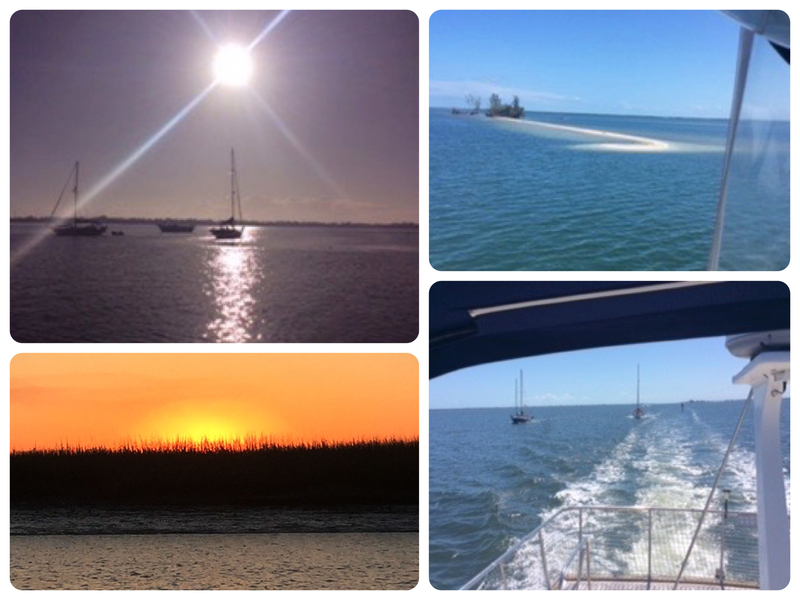 Although I was fine with staying home this winter, Al missed cruising. What’s a guy to do?? Flashback #1 to late August, 2016 – We met Colin on our stop in Lake Tashmoo on Martha’s Vineyard. Colin’s search for a trawler begins, with a little help from Al and his brother, Bill. Colin did find the trawler of his dreams, in Stuart, Fl through Al’s brother, Bill, the broker/owner of Stuart Yacht Sales. Towards the end of March, Al flew to Florida. First on the “to-do list” was a list of things to do for prepping the boat for the trip north. 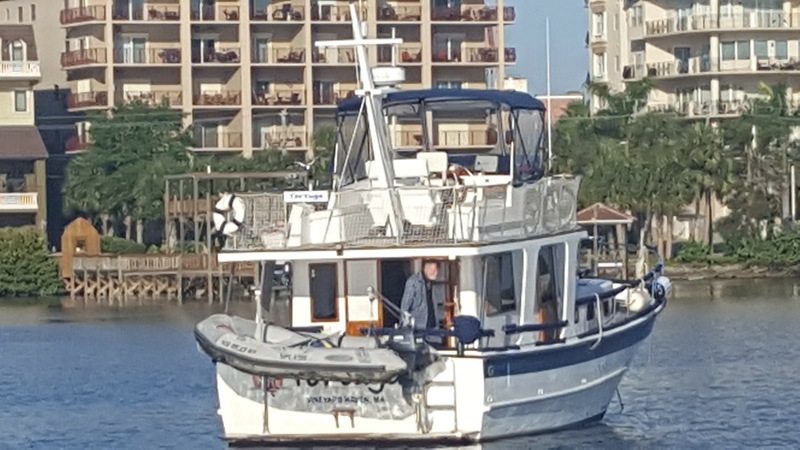 Al’s most unforgettable “to-do” was painting the anchor chain with the red-white-blue color scheme to mark the 25-50-75-100…. foot lengths. The anchor chain is stretched out on the dock. 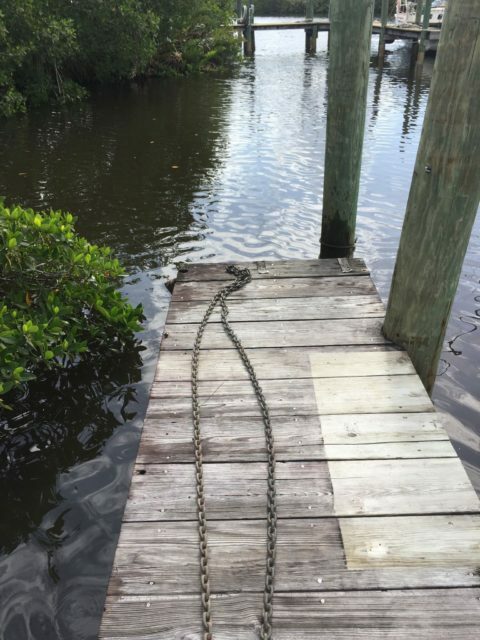 Al was carefully walking the chain out..towards the end of the dock……… when………. there was no more dock. Oops! Splash down into the water! Al on the swim platform, very wet with a very wet phone in his hand. Of course his phone was in his pocket. This is why he still has an old flip phone. 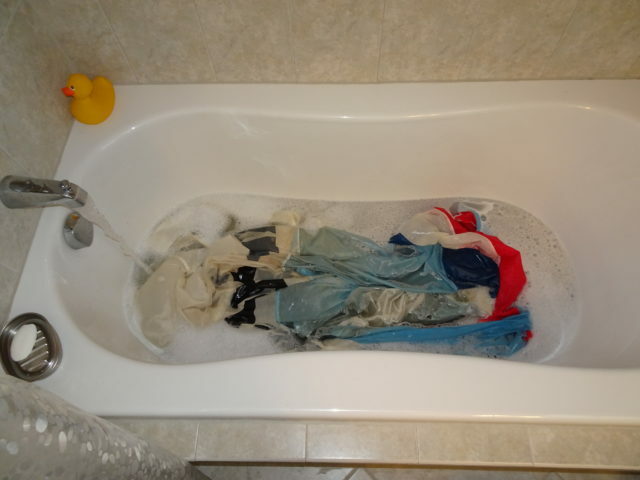 Next chore on the to-do list? A trip to the Verizon store, followed by a phone call to me explaining why I may not have been able to reach him. In case you are curious, his replacement phone was another flip phone, one of the few remaining of its kind. This is the second one that met its demise in water. Sometimes everything just works out nicely without planning. Our dear friends, Anthony and Annette, on Magnolia, were also in Stuart at this time. Al, Colin, and Anthony decided to take a road trip to Fort Pierce to explore Marine Connection Liquidators, the mega marine outlet and salvage store. With the right store, even guys can enjoy a shopping spree. Ahh, bliss! 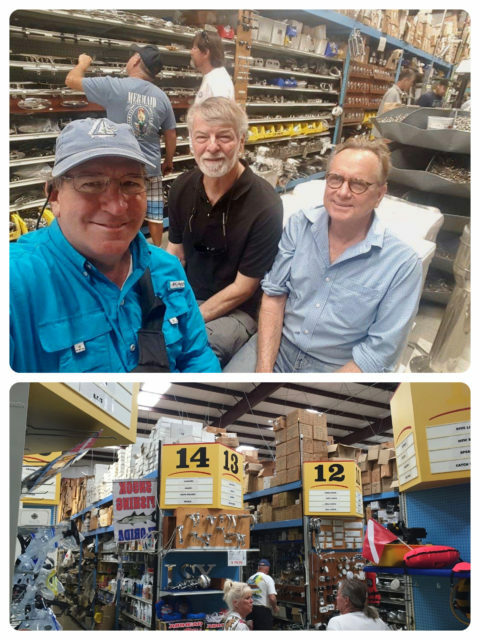 Surrounded by all things marine! Is Al hugging that pile of teak? I am so glad that this store is 1,000 miles from us. 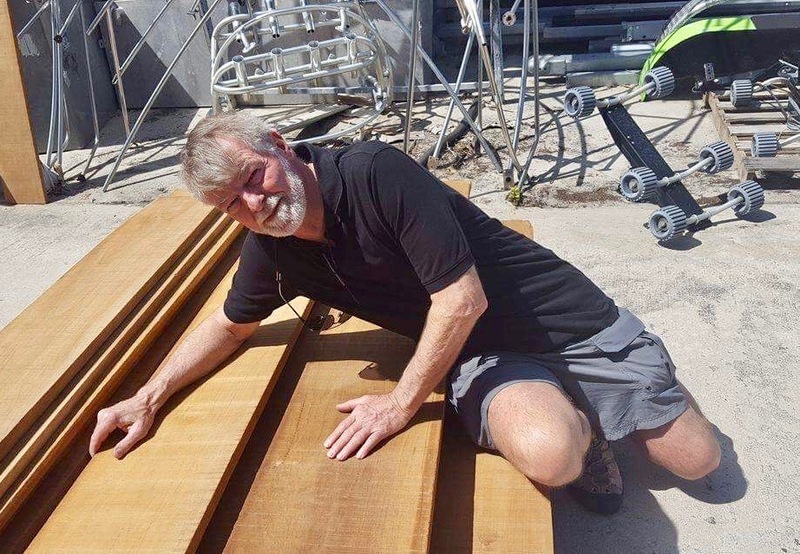 Step away from the teak! 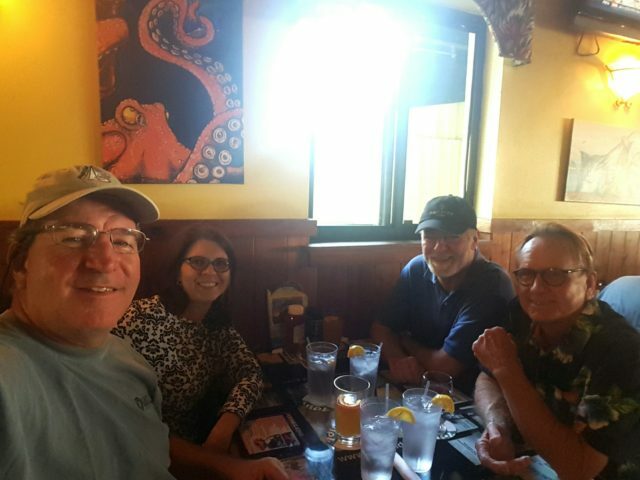 Shopping is exhausting, so it must be followed by a stop for nourishment. 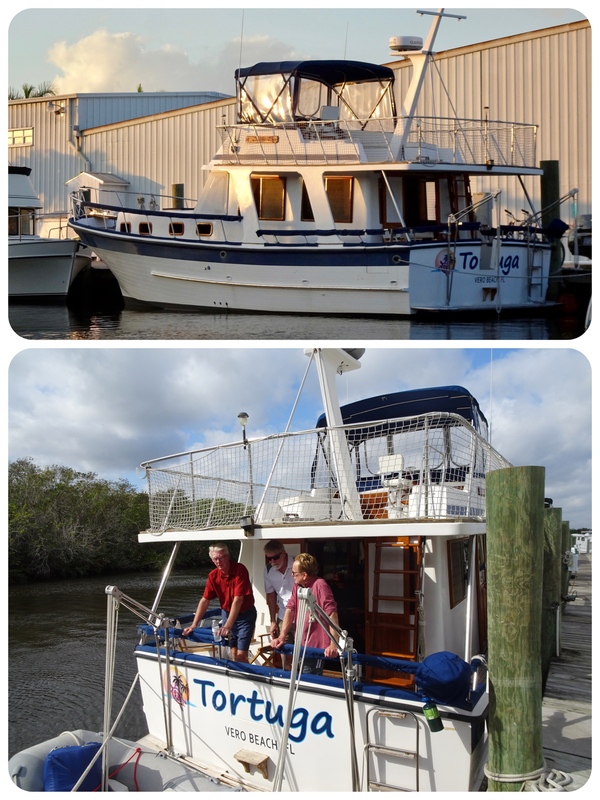 Both Magnolia and Tortuga would be traveling together up the ICW for a few days, with the first stop at Vero Beach. What a great way to begin the trip. Tortuga arrives in the Vero Beach mooring field. Colin at the helm, Al on deck. The two boats traveled together from Vero Beach to Coco Beach. 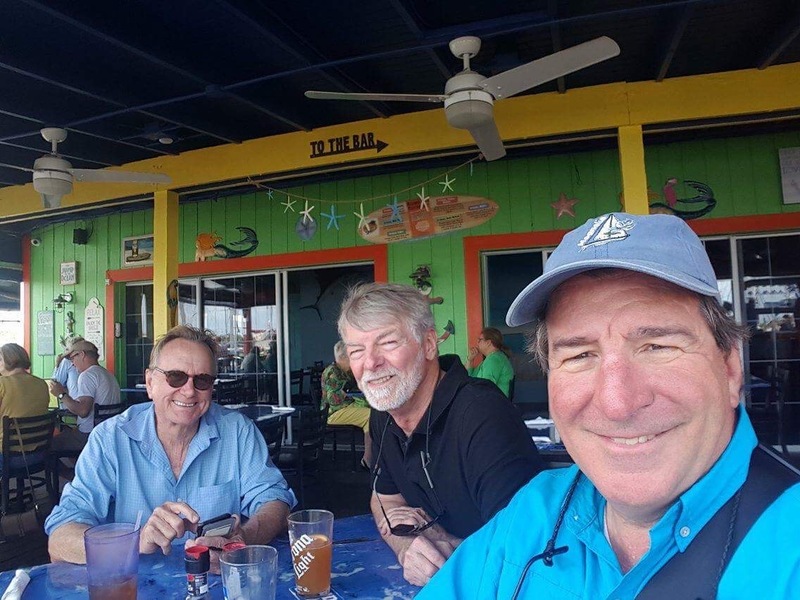 In Cocoa Beach, the crews of both boats celebrated Al’s birthday at a local restaurant. Happy Birthday, Al! I missed sharing it with you, but I am so glad you were able to celebrate it with friends. Ice Cream! It’s not a celebration without ice cream! But wait…. 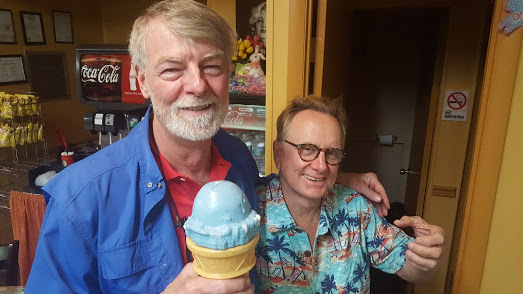 Al usually gets a cup, not a cone, and he doesn’t eat blue ice cream What’s the story here? 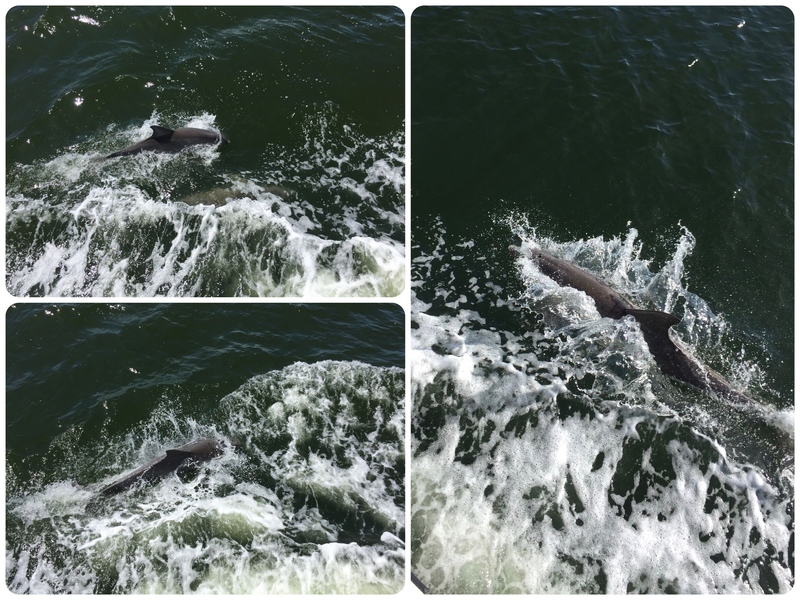 The dolphins seemed to like Tortuga very much, swimming alongside. Colin sent me photos of Al so I wouldn’t feel too lonely without him. 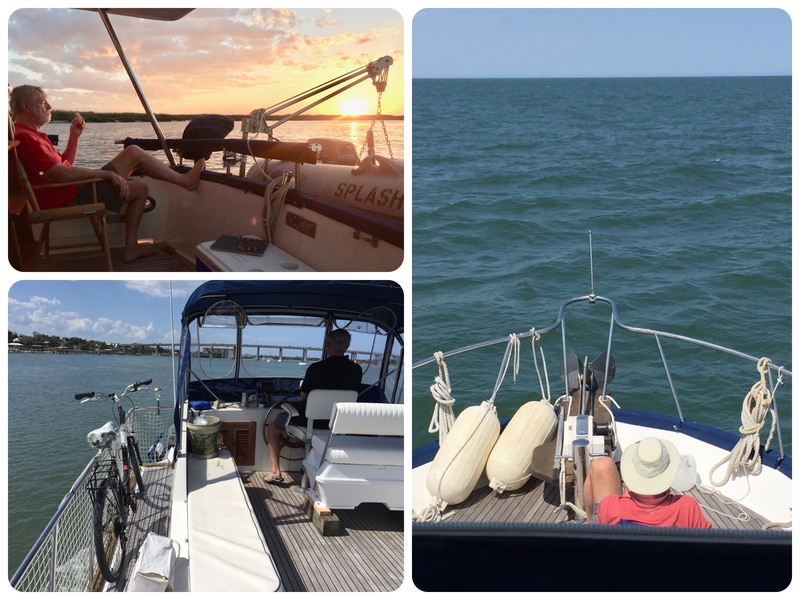 🙂 Here he is in various locations on the boat — at the helm, having breakfast in the aft cockpit, relaxing on the bow. 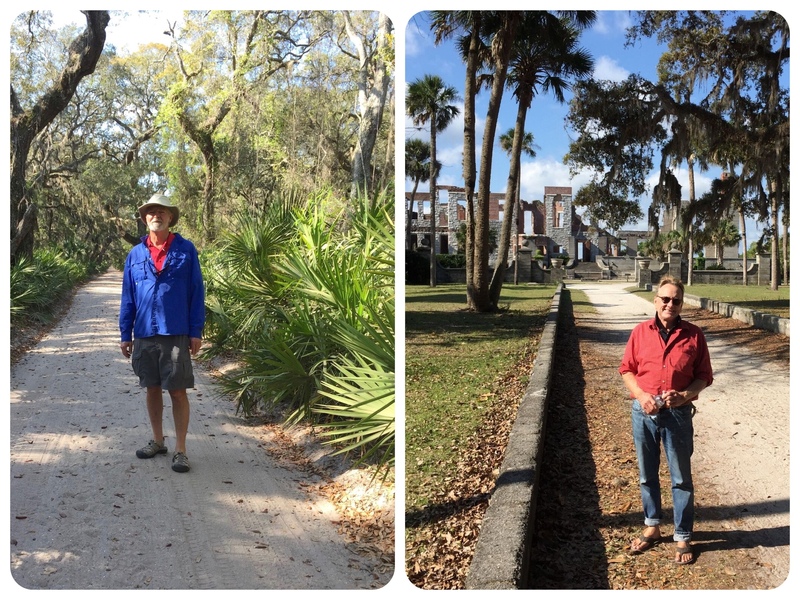 After crossing the border into Georgia, Tortuga stopped at Cumberland Island, a must see on our list of stops on the ICW. And that’s all the photos I have for Al’s mini-cruising adventure from Stuart, FL to Savannah, GA. He loved it! 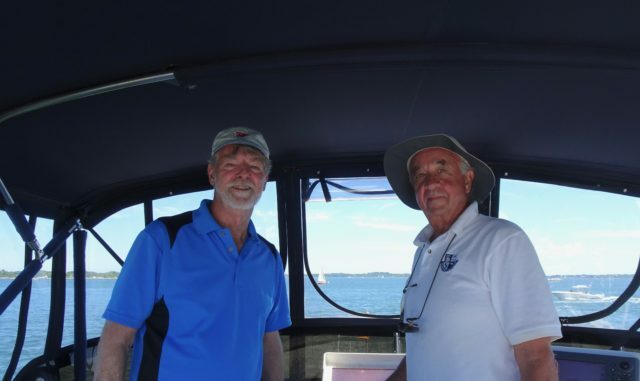 Later in May, Colin and his next crew member, Willie, arrived here in Connecticut at Shennecosett Yacht Club. 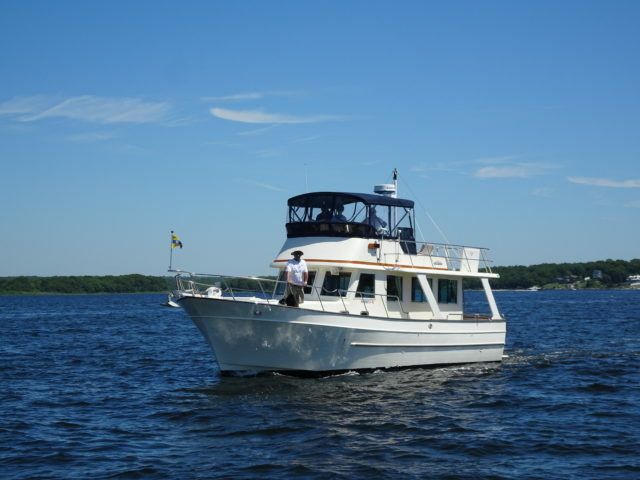 Tortuga passing UCONN’s Avery Point campus and entering our little mooring field. 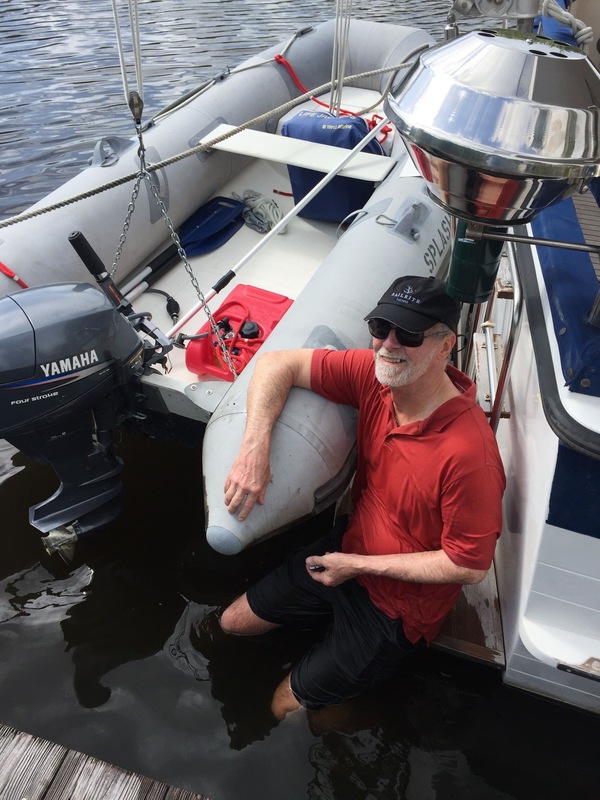 Al provides personalized mooring service and is ready to hand the line to Willie. We really enjoyed visiting with Colin again. After his stop at SYC, he finished the last leg of his trip home to Martha’s Vineyard. 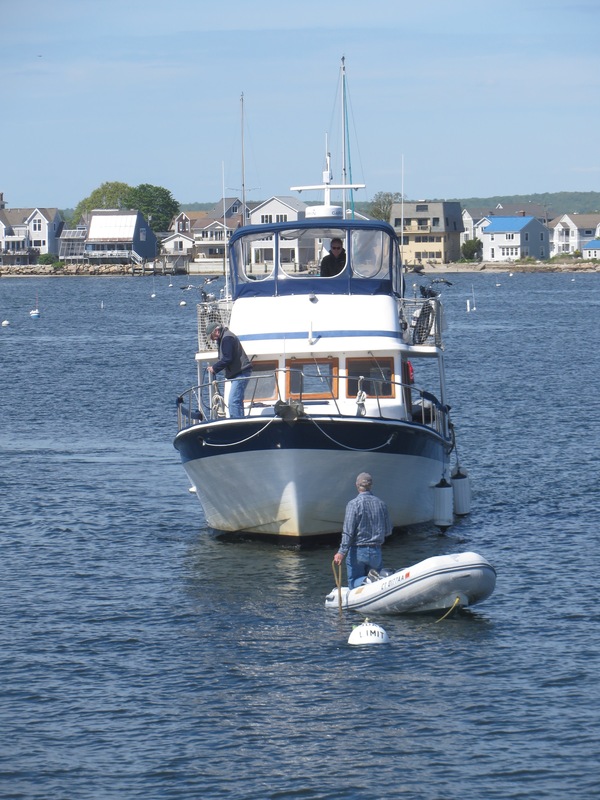 Next on the list of OPBs (“Other People’s Boats,” remember?) 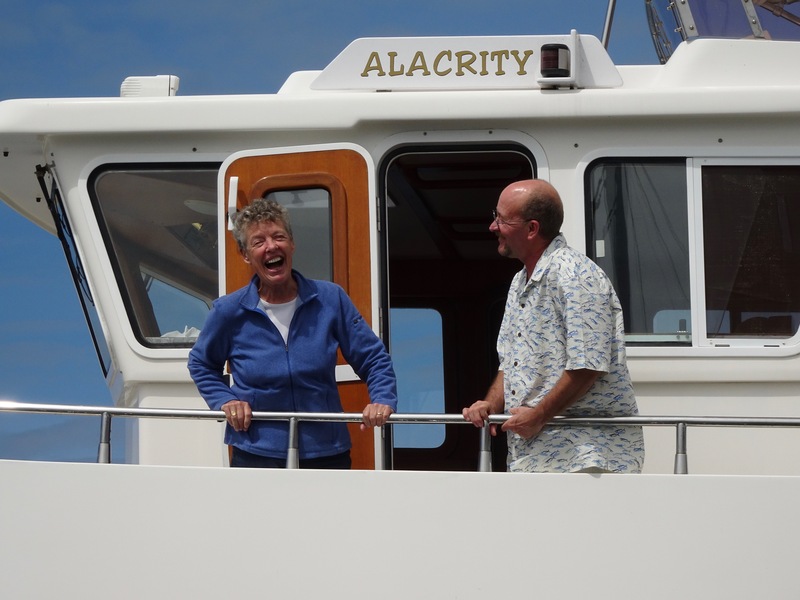 is Alacrity, a Selene 46. 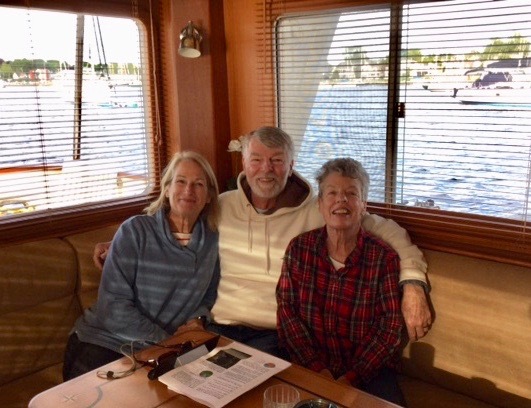 We met Laurie and Peter in Hope Town on Elbow Cay on our first trip to the Bahamas. 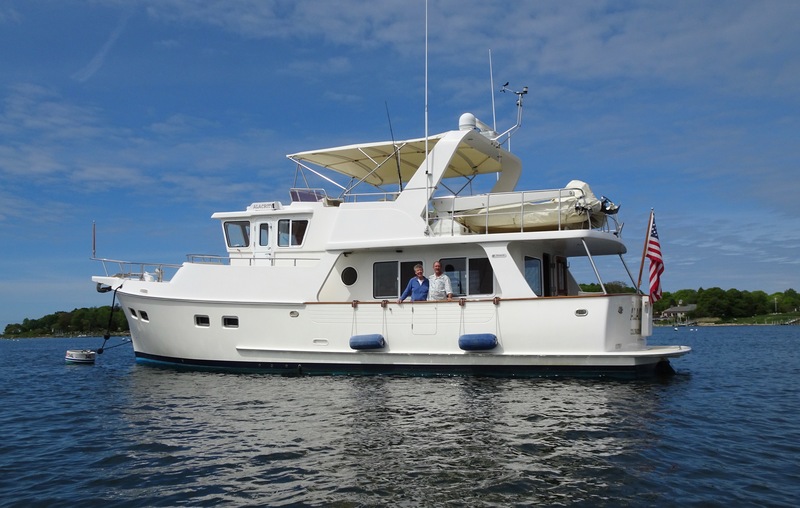 We continue to give them credit for solving the “what type of trawler would suit us best” problem – a sedan or Europa style similar to their Navigator, an Island Gypsy 36. 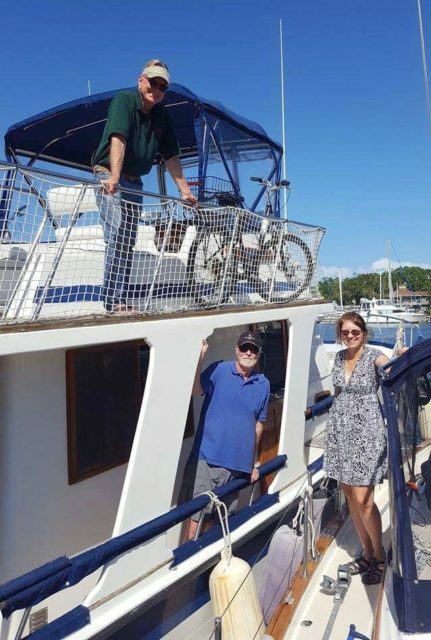 As beloved as Navigator was, Laurie and Peter decided to make the move to a larger boat. 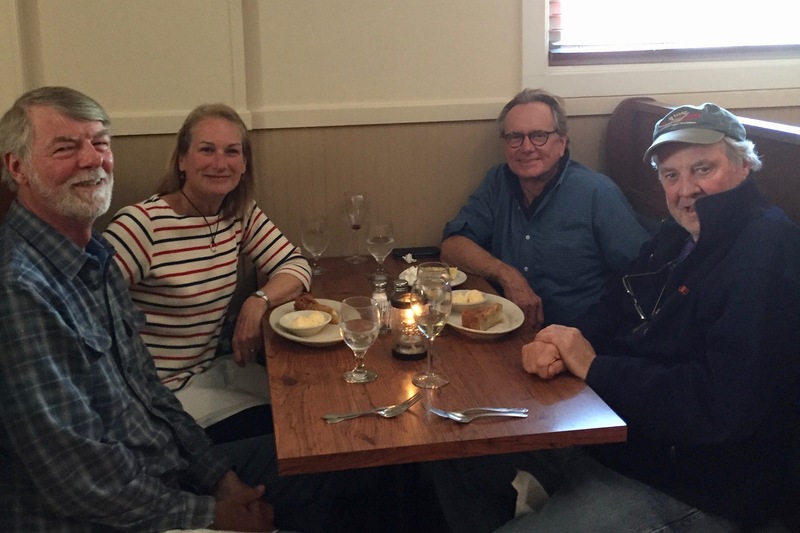 They found Alacrity in Virginia and brought her home to Maine in late May, which meant that our paths would cross again here in Connecticut, in Stonington. 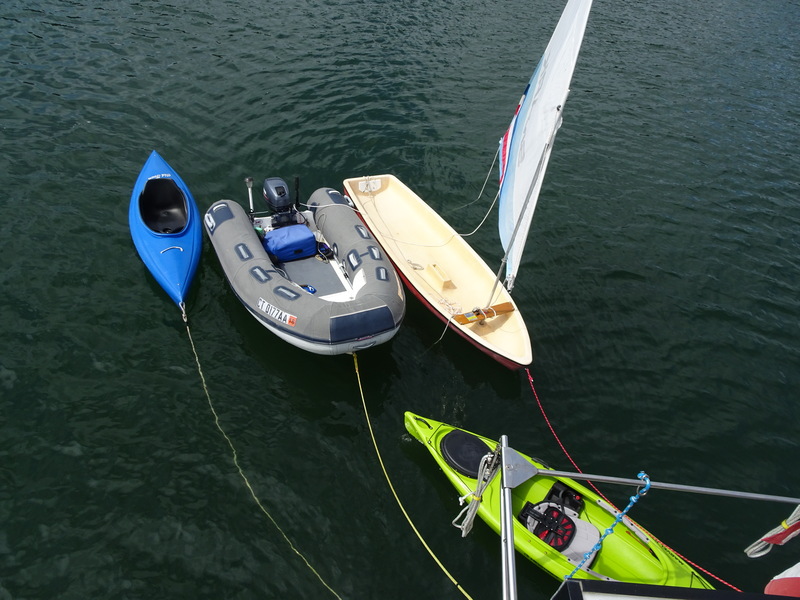 The Selene – what a boat! Not only did we have a tour, but breakfast was included! 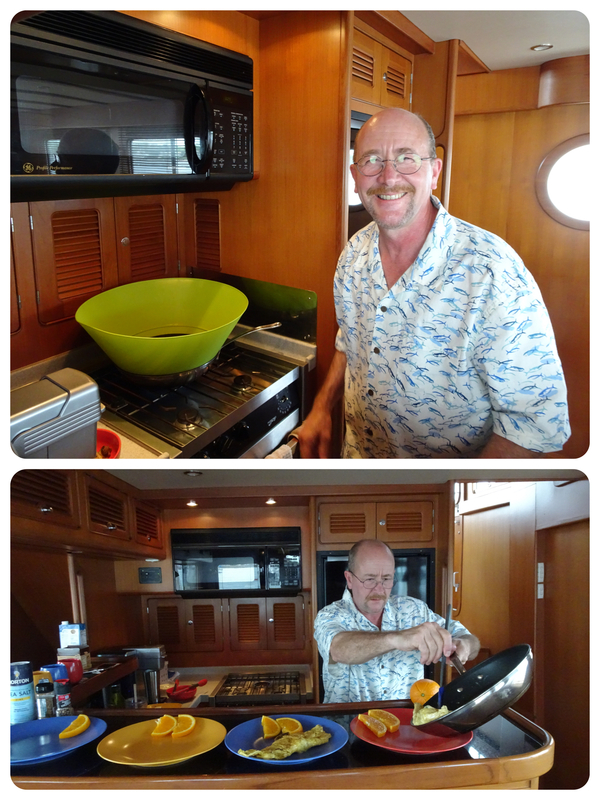 Chef Peter in his awesome galley. Al with Laurie and me in the salon, while Peter does the cooking. Next, and final, OPB for spring 2017 is Magic Moment, a Mariner Orient 38. In January, there was a comment on the blog from someone in the process of purchasing a Mariner Orient 38 in Annapolis. Also sailors who were transitioning to a trawler, Joe and Ann had found our Kindred Spirit blog. 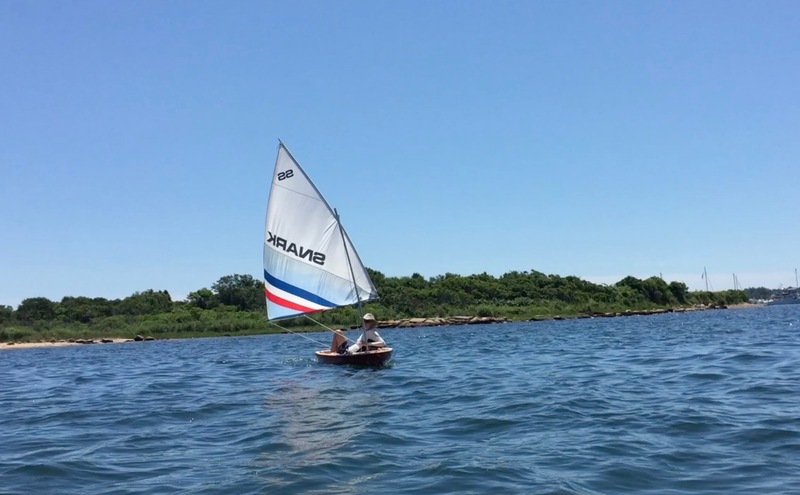 Even better, they are from our area, just down Fishers Island Sound in Westerly. 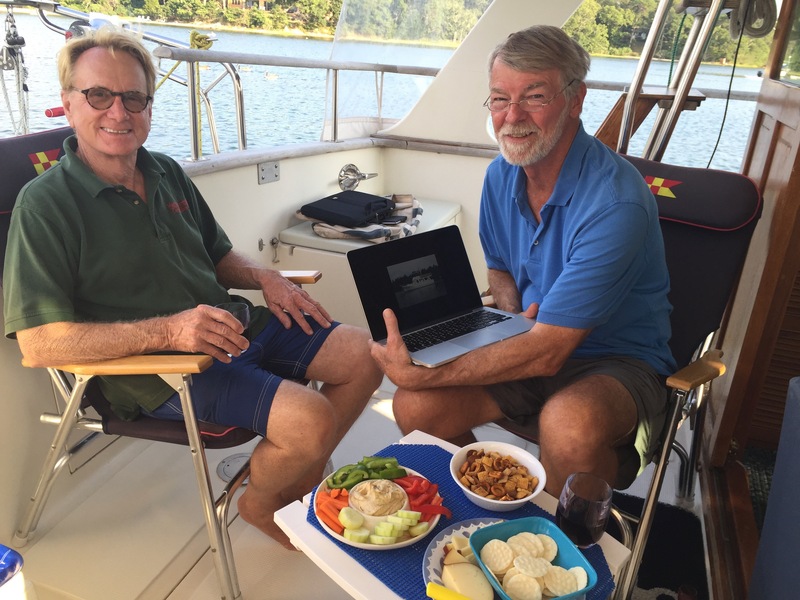 Al and Joe became email boating buddies as they traded information and ideas about their Mariners. This blog is primarily for us, not for any real or imagined audience; but it has proved to be an avenue for making new friends. We never expected that and what a delightful outcome it has been. 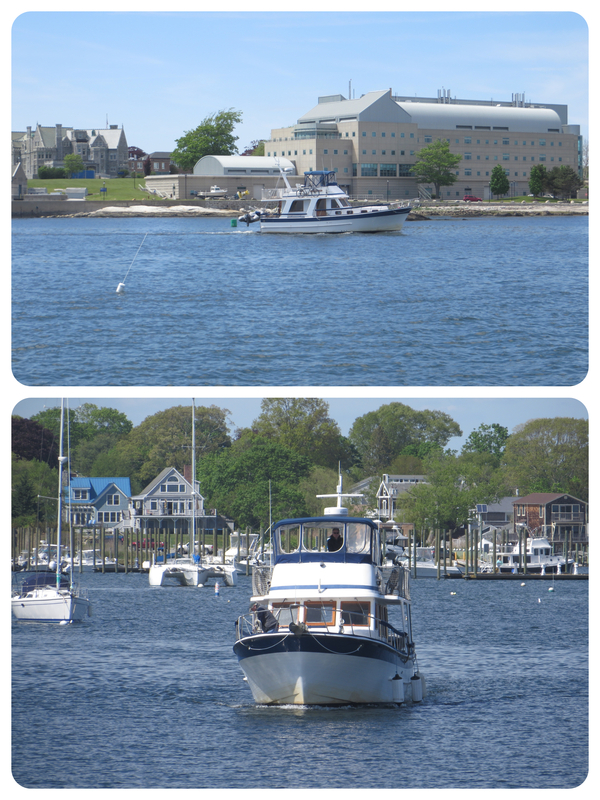 It took a while for us all to meet in person, but finally in late June, both boats were in Watch Hill at the same time! Magic Moment coming towards us in the Napatree anchorage. Wow, that boat looks familiar. 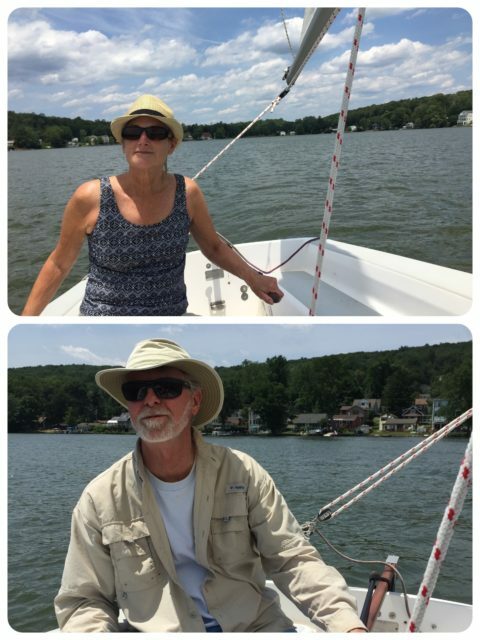 Ann and Joe on the bow of their Magic Moment. 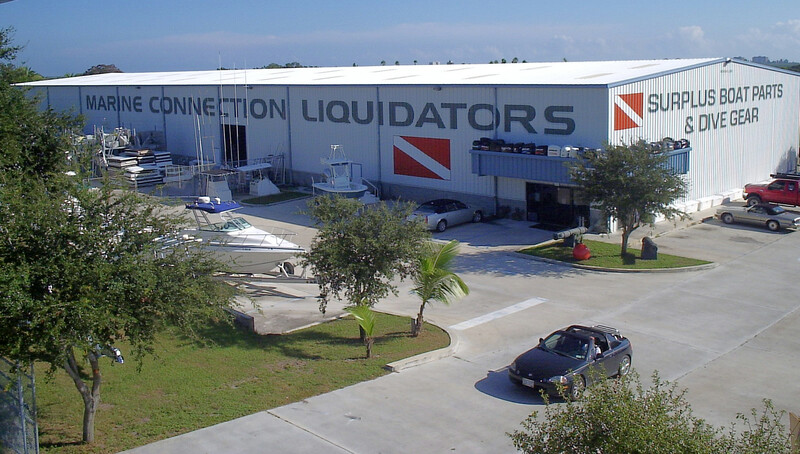 We know they will love their Mariner as much as we love ours. After months of procrastinating, it feels good to finally get this blog post finished. It has been gurgling around in my head for a long time, but life just wasn’t giving me the time or inclination to sit down and pound it out. Truthfully, this spring has been more challenging than usual. At 91 years of age, my father’s health deteriorated this winter and we knew he would not be with us much longer. I made more frequent trips to spend time with him and my mother, and feel grateful that I was there to say good-bye in person to him on Easter Sunday. I miss him. 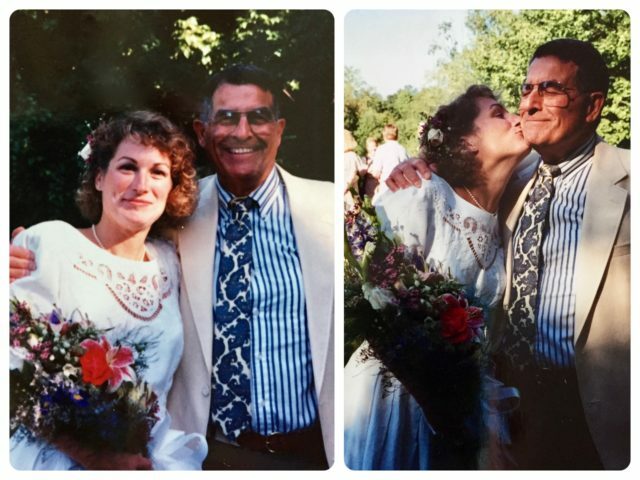 With my Dad on the day I married Al, 23 years ago. Love you, Daddy. Around that same time, Al was diagnosed with bladder cancer, which seemed to come out of the blue. After healing from the outpatient surgery, he began immunotherapy, 6 rounds, every Friday from June through the end of July. He tolerated it very well and feels ok (not like chemotherapy.) The doctor informed us that bladder cancer has a high rate of reoccurrence and Al will need to be monitored carefully, especially in the first year. The doctor also said “no” to another 8-months of cruising this year. That was the worst news to Al. We will beat this one, too. Stay calm and carry on, as they say…. or…. Stay calm and sail on.